In the beginning, there was darkness (which is great for owling but notably poorer for passerines!). Then, in about 1952, Kowa invented the Z-prism and the modern spotting scope was born. Kowa held top position in the spotting scope market until well after their patent ran out, and the other optics makers began to catch up. Since then, some of the competitors have replaced Kowa at the top. But with the introduction of the TSN-770 and -880 scope lines, Kowa is clearly back on top. The TSN-770 series is the smaller of the two newest scope lines from Kowa. We've reviewed scopes before. We've reviewed Kowa scopes before. We've never seen anything like this scope before! We received the 88mm angled fluorite model TSN-883 ("Prominar", for those of you familiar with Kowa terminology) for review from Kowa and the eXtra-low Dispersion 77mm TSN-773. Since our tests, we received a TSN-884 whose optics were identical to the 883. The TSN-883 and -884 are reviewed in another article. We took both scopes out into the field along with several very fine scopes from other manufacturers. Thanks to a brief preview, we fully expected the TSN-883/884 to come out on top. What we didn't expect was that the TSN-773 would finish second. Although the 77-mm Kowa was matched against scopes of 80-82 mm, the new Kowa was still detectably brighter, a difference that became more and more apparent as the evening light began to fade. The image brightness and clarity were really impressive. The flat-field performance is stellar, as the image remains perfectly sharp right to the edge of the field. When you pan across the field with the scope, it’s like moving a picture. In fact, it’s so beguiling that you fail to notice it because you get so distracted by what you’re seeing. In effect, the scope becomes invisible, and you forget that you’re using it. There was the a hint of color-fringing at the field edge, and this was slightly more pronounced on the 773, but you really had to look specifically for this in order to observe it. It is so minor that we’re really only reporting it so you know we’re being honest. The objective lens on the TSN-773 is eXtra-low Dispersion (XD) glass and the lenses are made of environmentally friendly eco-glass. As with the larger models, the 773 lenses are fully multi-coated with Kowa's C3 coatings that are made of dielectric materials instead of the more common silver or aluminum. Kowa claims 99% or higher light transmission. While we don't have equipment to measure that, the superb light transmission is obvious in the viewing. As is expected in scopes of this quality, the body is sealed and nitrogen purged to be waterproof, and internally dustproof and fogproof. Less expected is the fact that the individual eyepieces are also sealed the same way. 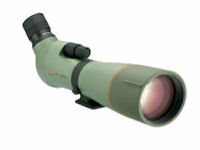 The TSN-773 is a very compact 12.5 inches long (without eyepiece) and weighs less than 3 lbs (46.9 oz.). This is at the light end of the spectrum for 77-to-82-mm scopes, due in part to its magnesium alloy casing. The lens hood pulls straight out, and as always, we strongly recommend using it. In one of the few shortcuts they took, Kowa provided only a shallow double groove on the hood to enable sighting on a target. Again, this is a minor quibble. Just in passing, the minimum close focus on the TSN-773 is 16.5 feet, about average for a high-powered scope. Then again, the whole point of a spotting scope is viewing distant objects. Another distinctive feature of this scope is the dual focusing mechanism. Other manufacturers have had this innovation for years, but Kowa has added it on the new models. In the new Kowas, this mechanism was nicely executed. There are two focusing knobs side-by-side. The larger knob nearer the eyepiece is for coarse focus, while the smaller knob is for fine focus. The knobs are placed so that the fine focus sits comfortably under the middle finger while the index finger is positioned for the coarse focus. The 773 goes from minimum close focus to infinity in two full turns of the rough focus knob. The mechanism is so smooth that when focusing, the image remains rock steady. With a helical focusing mechanism, it is virtually impossible to adjust the focus without causing the image to tremble. Whether or not this is significant is debatable, but the fact that it’s impressive is not. The 770 series scopes use the same eyepieces as the 880 series scopes, so we have already reviewed them and haven’t really got anything new to say about them. The same also holds true with regard to digiscoping adaptors and attachments. Please refer to that review for a discussion of the eyepieces that we looked at on these scopes. One point that deserves updating with respect to these was that in that review, we noted that the eyecup adjustment frequently came unscrewed while we were adjusting it, because the digiscoping adaptor is designed to fit in the place occupied by the eyecup. We subsequently learned that giving it a small amount of torque at the end of twisting it in would solve the problem. At the time of the 880 series review, the digiscoping accessories were not regularly available. Those parts are now all available. The tripod mounting foot has a removable threaded bushing that allows the user to select between 1/4-20" and 3/8" mounting screws, which gives the user more choices among tripods. The tripod mounting foot sits on a rotating collar, held in place by a setscrew. When loosened, the scope rotates freely in either direction, with 6 click-stops pre-set in the most logical positions for field use. While not initially available, Kowa has finally released the cases for the 770s and 880s. The case is has a water resistant green cordura nylon outer shell, thick foam rubber padding, and lined with soft, smooth nylon. There is one zipper that opens the flap over the objective lens, one on the bottom for letting the mounting foot through, and one that starts underneath the scope's prism and goes around the eyepiece almost to the objective flap on the top. Velcro patches on the flaps and under the objective keep the flaps in place during use. We recommend purchasing the case because there is no armoring on the scope body, and it's $60 cost is inexpensive insurance for protecting this investment. And it is a significant investment: the TSN-773 body may be found for as little as $1,600.00, while eyepieces run $700.00 for the 25-60x wide angle zoom eyepiece, and $400.00 for the 25x long eye relief eyepieces. The 30x eyepieces have been discontinued. Is the Kowa TSN-773 scope the finest scope we have looked through to date? Not quite. Its big brothers, the TSN-883 and TSN-884 can claim that title for now. However, if you prefer to save $850 and about a half a pound, you need look no farther. Looking through this scope in the field will change your opinion about what kind of resolution, brightness, and clarity of image are possible in a 77mm spotting scope.